Posted on October 13, 2017 by Lea S.
Quoted from one of the documents compiled in British Cinemas and Their Audiences by J.P. Mayer. Known today for such horror classics as The Cabinet of Dr. Caligari and The Man Who Laughs, Hans Walter Conrad Veidt (nicknamed “Connie”) came from a quiet and sensible background. He was born on January 22, 1893 in Berlin to a middle-class, Protestant family, and his father was a former Royal Artillery sergeant who worked as a civil servant. As a boy, Veidt had initially dreamed of becoming a surgeon. He had been inspired by the time a heart surgeon had performed a risky operation on his father, saving his life against all odds, and then tactfully only charging the family the little they could afford to pay. Deeply impressed, young Veidt hoped to one day be just as honorable. One day, he would be–although not in the way he had anticipated. Said to be one of his boyhood photos. After realizing the sheer amount of education it took to become a surgeon, Veidt became discouraged. Fortunately, he had another passion: acting. After delivering a fine monologue for an otherwise dismal school play, Veidt felt the stage was his destiny. He left school without a diploma to study the great actors of his time (which fortunately wasn’t a difficult task, considering the prominence of German theater in the 1910s). His mother was delighted, but his father was not pleased. 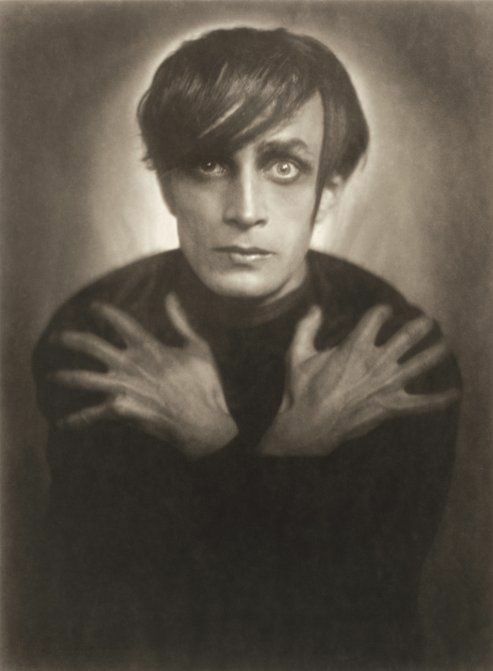 Veidt later recalled him lamenting, “An actor is a gypsy, an outcast”–however, the young man had made up his mind. Rehearsal of the Reinhardt production Oedipus in London. That same year, Veidt’s father passed away. For the rest of his life, Veidt would grieve that his father had died too early to witness what a success his son would become. The key to that success was Veidt’s decision to start appearing in motion pictures, where he tended to have “exotic villain” roles due to his strong facial features (one early horror-type role was of Satan in Der nicht vom Weibe Geborene). He found it little trouble to act in films during the day and perform on the stage at night, where he was appearing in notable German Expressionist productions. 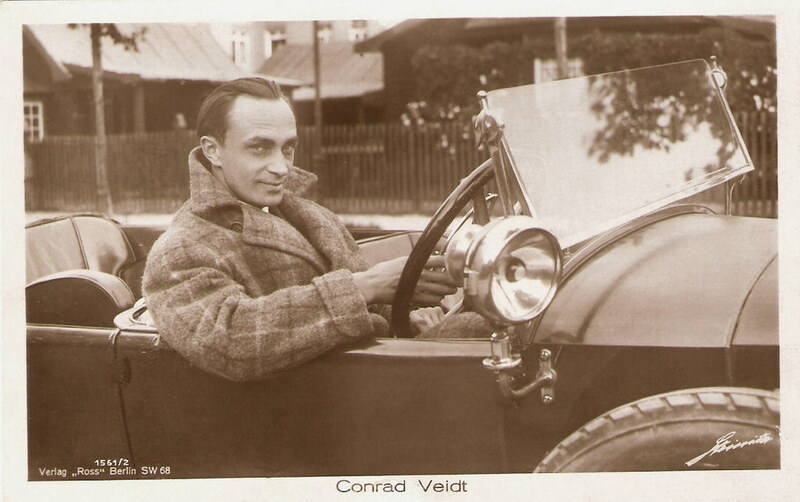 Conrad Veidt…is a very strange-looking young man with a face you will never forget. His eyes haunt. He dominated the stage. I forgot the others when he was on. I hope his fate will not be to go on to films, but undoubtedly film producers will be rushing for his services. Some of his most notable early film roles were for a series of Aufklärungfilme, or “enlightenment films,” which tackled such heavyweight subjects such as prostitution, STDs, and even homosexuality. The latter was presented in Anders als die Andern (or Different From the Others, 1919), in which Veidt gives a sensitive performance as a gay violinist who falls for his student. Around this same time he married his first wife, Gussy Holl. In 1922 his beloved mother would pass away, and first marriage came to an end. Despite these hardships he continued to hone his acting skills. His ties with the influential German Expressionist movement as well as his flair for villainous roles was further cemented by his work in The Hands of Orlac (1924), Ivan the Terrible (1924) and The Student of Prague (1926). In the midst of this joy Veidt received a telegram from John Barrymore, inviting him to Hollywood to make a picture. The offer being too important to pass down, he reluctantly left his wife and child and sailed to New York. Upon seeing the vast, busy metropolis, he remembered thinking wryly, “Ah, now I am playing in ‘Caligari’ again.” Once in Hollywood (where he received a warm welcome), he acted in Barrymore’s film The Beloved Rogue (1927) to much critical acclaim. He would eventually send for his wife and child and they would live together in Beverly Hills. He would only make a few pictures in Hollywood, including The Man Who Laughs (1928), a difficult role that required him to do much of the emotional acting with his eyes alone. (It’s said that the Joker was modeled on Veidt’s appearance.) The coming of talkies was tough on him, due to his thick German accent, so he decided to return to Germany and resume acting there–missing out on an offer to play the lead in Dracula. His marriage with Felicitas would end in 1932 (he would later say the failure of his first two marriages was due to having a psychological “mother complex”) and the following year he would wed Lily Prager, who he’d remain happily married to until his death. He would remain close to his beloved daughter and on good terms with his ex-wives. But back in Germany Veidt was starting to find the rise of Nazism intolerable, especially since Lily was Jewish. He would make films in Britain, particularly the pro-Jewish The Wandering Jew (1933) and Jew Süss (1934), which brought him to the attention of the Gestapo, which imprisoned him for a time. Not long after marrying Lily he had to fill out the “racial questionnaire” imposed by Joseph Goebbels, where German actors had to state their ancestry in order to stay employed. Gentile Veidt deliberately wrote down “Jewish.” Soon after the couple left Germany for good. His second-to-last film was Casablanca (1942), where he played Major Strasser (and was the highest-paid actor in the film, despite having a supporting role). His last film would be Above Suspicion (1943), costarring Joan Crawford. A few months after shooting was complete, he would suffer a heart attack while playing golf at the Riviera Country Club. He was pronounced dead on the scene. Only 50 years old, he never saw the end of the war and victory of the Allies he had been so passionately supporting. Yet he left behind a legacy every bit as honorable as that of the surgeon he had admired so long ago. Remembered for both the Weimar era Caligari, sometimes argued as prophetic of the Nazi regime to come, and WWII era Casablanca, with the theme of risking everything for the Allied cause, Veidt is forever linked with a time that he had personally witnessed. He was one of cinema’s finest actors, and a gentleman who was a hero behind the scenes. Eisner, Lotte H. The Haunted Screen: Expressionism in the Cinema and the Influence of Max Reinhardt. Berkeley and Los Angeles: University of California Press, 2008. Morin, Edgar. The Stars: An Account of the Star-System in Pictures. New York: Grove Press, Inc., 1961. Soister, John T. Conrad Veidt on Screen: A Comprehensive Illustrated Filmography. Jefferson, North Carolina: McFarland & Company, Inc., Publishers, 2002. Gebhart, Myrtle. “His Nickname Is ‘Connie’.” Picture-Play Magazine, December 28, 1928. “The Story of Conrad Veidt” [Special section]. Sunday Dispatch, London, October 14–November 4, 1933. This entry was posted in Personalities, Uncategorized and tagged 1910s, 1920s, Casablanca, Conrad Veidt, Different From the Others, German Expressionism, silent drama, The Cabinet of Dr. Caligari, The Man Who Laughs by Lea S.. Bookmark the permalink. Thanks for this well-researched and sober article–I really appreciate it when someone strives to get the facts right. There are several false factoids floating around about him, even including his birth name (I’ve seen his birth certificate in Lebensbilder and it’s definitely spelled with a C), that people keep replicating when they write about him–if they write about him at all. It’s refreshing to see people talk about the man’s entire career instead of all the endless Joker posts. He’s incredibly underappreciated as an actor and deserves to be more well-known, especially beyond his early silent horror films–he really came fully into his powers in the talkies, IMHO, and they’re the ones that are the hardest to find unless you’re really dedicated. I’ve tried to do my part by distributing my Veidt collection as far and as wide as I can, but what we really need are more subtitled DVD releases of his German talkies and his British films in particular. One can only hope articles such as these help spark more interest in his long and varied career. Can you please share a link to the films you have of him? I am a such a fan but I’ve only seen him in Caligari, The Man Who Laughs and Casablanca. (although I have Orlacs Hände downloaded already, but haven’t watched it). Thanks in advance! I can share my link, if the maintainer does not mind! Go to veidtveidtveidt dot tumblr dot com and click “Masterpost.” I’ve had to wrangle the links all over the place, so now the blog I’m posting updates to (the Tumblr one) is the main one to follow if you want to know what’s been added and/or changed, but the links themselves are on yet another blog over on LJ. A couple of friends and I have also been creating and editing subtitles for his German films, but we still need help with a couple of films as it’s gruelling, slow work. We haven’t got subs for The Chess Player yet (since none of us speaks French) either. So we’re always looking for people to help–even a transcription of the German/French dialogue would be a big help, a translation even better (it’s the creation/timing of the subtitles that’s the hardest part of the subtitling process). We’ve managed to create subs for Rasputin and Der Mann, Der Den Mord Beging and Der Schwarze Husar so far–all worth watching so people can get a good idea of his range. Rasputin’s more like a docu-drama and not that great a film, but his performance is always interesting even if the film might not be that good. Der Mann is a very bleak and depressing film, but his performance is incredibly subdued, subtle and intelligent and a world away from the staring, flailing (or hypersexed) creature he’s often seen as. Husar is great, frothy adventure fun–one of the rare times he got to play a hero. You’re welcome, happy to oblige! It’s so true, Veidt is one of those actors who gets treated more like a trivia answer on Jeopardy (“This actor’s fixed grin was the inspiration for the Joker”). But he was considered one of the greatest talents on t he screen, a true artist–apparently he had the ability to get any sort of role he asked for, filmmakers were actually willing to listen to his ideas. I know a few of his talkies are on YouTube but it would always be good to see more. I’d love to see more of his German Expressionist films from the late ’10s/early ’20s, but I suspect a bunch of them are lost. Doubtless they wouldn’t have been carefully preserved throughout WWII, if you know what I mean. I’ve shared the link to my collection above:) I’m always trying to convert more people to him, but if his films aren’t even available, it’s going to be difficult to get people into anyone, really. That’s why I started the blog. I’ve used various channels to fish out those obscure films nobody–even the archivists–don’t seem to care about anymore, but there are some amazing gems in there that are well worth discovering. The Student of Prague in particular–my file being a TV recording from Germany in the 90s that’s of a better quality than the DVDs available–is an absolutely amazing film and should be recognised right up there with Nosferatu and Caligari and all the other German Expressionist classics. That’s the one that really kicked off my Veidt obsession, and I am still slack-jawed at how unknown it is. A film curator friend of mine is trying to arrange a showing of it in London as soon as she can, to help make it more known. And yes! It’s astonishing how when you go back and read the old magazines–how he was really seen as *the* greatest actor on the screen, for decades, and just how popular he was. And now, hardly anyone knows him, or only knows the silent horror star and even the horror buffs don’t bother to check out his other films. It’s a crying shame, as I feel he perfected himself in the talkies, becoming an entirely different man–no longer the cursed, tormented victim of the silents, but one who exercised hypnotic, devastating, spiritual powers over others instead (not that I don’t love the silents, too, but it’s his talkies that are the most unknown and grossly underappreciated of all). In the Wandering Jew, he becomes this spiritualised, saintlike character in the end, absolutely glowing with an internal, holy light, and in The Passing of the Third Floor Back, he plays an angel (or possibly Christ–it’s deliberately left vague)–and definitely one with an Old Testament level of power and awe. Yet it’s just the demon most people know him as. I always get more reblogs and likes on Tumblr if I post gifs of him in his stereotypically pale and skeletal silent roles–all the goths wake up and reblog them with tags like “vampire”… but even if I post long flaily essays on the complexities of films like A Woman’s Face (which I consider his best talkie performance), hardly anyone cares. Or then I might get notes if I try the social issues angle and go on about those aspects of his life and work, of his fighting the Nazis, promoting gay rights, things like that. Granted, a part of that is due to the age of the target audience, the place being full of teenagers, but it’s also where fandom is, so that’s where I’m most active in my Veidt preaching. But, anyway, now I’m rambling–thanks again for this post. Here’s hoping it’ll spark at least a little more interest in the man and his career. Thank you so much for sharing your thoughts, it’s very appreciated! Yes, it can be tough to “spread the good news,” but it’s always worth doing, because you never know just who you’re going to reach. If someone’s work strikes a deep chord with someone, it can have an amazing impact on their life (I can attest to that, as can you, I’m sure!). I’ve only seen clips of the 1926 Student of Prague, and it looks incredible! 😀 I stumbled across that recording while researching this article! Apparently it got popular for awhile in the ’80s after someone called and requested it at a radio station. I have read many, and written a few, articles about Conrad Veidt but I have to give First Prize to your essay. Informative and charming, your essay whets the appetite of the reader to run out and see as many of Conny’s films as possible. Let me suggest that you post a link to this essay on the FB group, The Cabinet of Conrad Veidt. I’ve posted number of items there including some of his films. Thank you so much, sir! It was an enjoyable article to research. I think what impressed me most was discovering just how passionate Veidt was about his acting. He never lost focus, always worked hard. Even if he wasn’t well-received it didn’t faze him–he knew this was what he was meant to do. I love that. Thank you for this post, I’m always so irrationally happy when people talk or write about Veidt. “Contraband” (1940) is a wonderful film, and everybody should run right out at see it. It was Powell and Pressburger’s second collaboration, and Veidt is fantastic as the hero, a Danish sea captain. Love it! Thanks, Lea! That is a darn good article! Photos and such from “Caligari”‘ are partially to blame for me getting interested in silents, so I am forever grateful to him for that one, for sure. But whenever I hear that Veidt is in a movie I’m curious about, it always ups my interest about a million percent. (Such has been the case with “The Beloved Rogue” recently.) =) Thanks again! Hello, i recently discovered this blog and i love it. I love the silent movies and the history of those years and vampire makeup. I have not been able to read much of what has been published, especially because my english is regular, but i have enjoyed the page a lot. One issue that strikes me a bit is to see abuse of the phrase ” expressionist movies”. Actually there are no more than three or four expressionist films, so that name should no longer be used for fantastic or psychological german films. Many german films of those years used expressionist ideas, but only that. That is to say, i would not call a police drama “amorous film” just because it includes a love history. 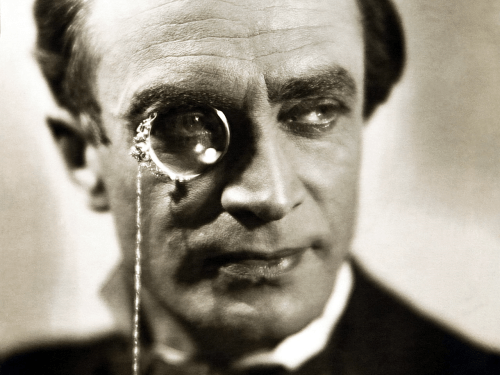 Conrad Veidt only filmed an expressionist film, the other that are labeled as such are not, they are just fantastic. I have seen 15 of his films; i have seen them in german, english or spanish. I love this man, i love his talent, his dramatic power, his ability to play any character and work in any genre. He makes me cry in “The man who laugh” and makes me laugh in the musical comedy “Der kongress tanz”. And he himself was a wonderful person, you can not find garbage in his personal history. He was a stranger to this world. I love him. It’s true that the German Expressionist label tends to get thrown around too much. Like you said, it was a genre with specific ideas and a specific, deliberately artificial-looking style–CALIGARI, FROM MORN TO MIDNIGHT (1920), GENUINE (1920) and RASKOLNIKOV (1923) are among the few that are truly German Expressionist. I do feel that the word “Expressionist” (excluding “German”) has evolved a bit to be a vaguer term for films that were inspired by the looks or themes of German Expressionism. Thus, I have no problem with using it more generally. 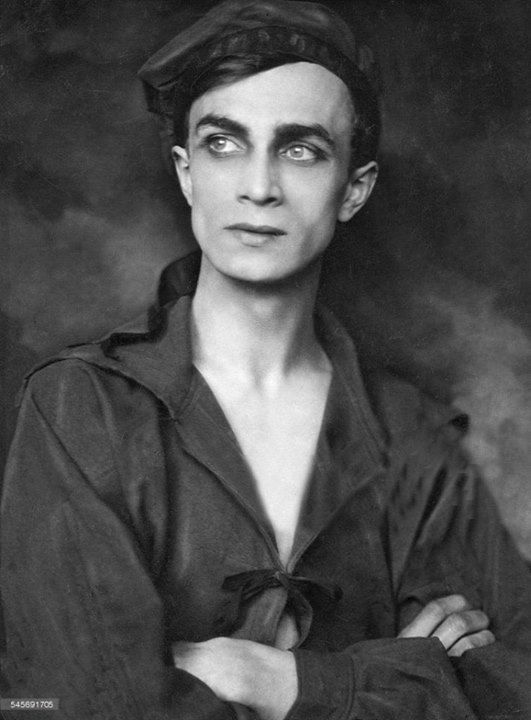 Anyhoo, I do want to clarify part of my Conrad Veidt article–I said, “His ties with the influential German Expressionist movement as well as his flair for villainous roles was further cemented by his work in The Hands of Orlac, etc.” My wording wasn’t great, but it meant Veidt’s work in those films would’ve reminded audiences of his ties to German Expressionism, not that the films himself were German Expressionist (clear as mud, I know 😀 ). Oh, no worries at all! I’m very happy you’re enjoying Silent-ology–you’re always welcome to drop by. A very beautiful article – thank you! I’m so happy you enjoyed it, Indrid–and welcome!